It is reported Clause 36 of the National Medical Council Bill provides for recognition of medical qualifications granted by statutory or other bodies in India which are covered by the categories listed in the Schedule. The clause was met with a demand from the DNB candidates across the country demanding the equivalence be granted to the degree in all respects to MD/MS degrees. Ms. Sujatha Rao, former Health Secretary, when asked for opinion before the committee suggested merging NBE to have one MD degree. The Committee notes that India has two parallel systems of Post Graduate Medical Education i.e. MD and DNB. 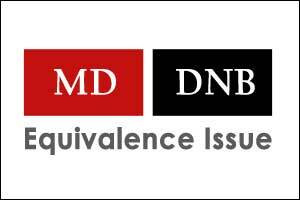 The Committee recommends that the Diplomate of National Board, granted by the National Board of Examinations, in broad specialty course and super-specialty course shall be equal in all respects to the post-graduate qualification and the super-specialty qualification, respectively, as granted under this Act with the exception in teaching in medical colleges as they do not take DNB education in a medical college. With the coming into force of this Act, all the post-graduate education programmes being conducted by the National Board of Examinations will be brought under the purview of the Commission for award of common degrees. 2 problems…. One which is\”superior\”..MD or DNB. Two how to bridge the shortage of teaching faculties for quality education. Second all those who want to go to teaching should undergo Train the Trainer courses and qualify to teach. No one should have a passport to all the good things in life. If the so called MD specialists have reservations on working in rural medical colleges leave it to specialist DNBs who have this experience. They will sooth the rural souls. Practical training is also poor in many medical colleges but passing DNB exams is difficult for everyone and if candidates from medical colleges appear in DNB exams, only 10% will pass. DNB is much superior than MD/ MS. It takes only one year of training in medical colleges for DNB candidates to come at par with MD/MS candidates in hands on training and practical knowledge, but what is the criteria for MD/ MS students to come at par with DNB candidates in theoretical as well as clinical knowledge. And hence I feel both degrees are equivalent , whatever lacunae remain in DNB or MD/MS candidates , are fulfilled over a passage of time, whether in teaching or non teaching institutions.